Some time ago, I reviewed Demeter Jelly Belly Hot Fudge Sundae and noted that it smelled more like brownie mix than a hot fudge sundae. I wondered at the time how it compared to Demeter Brownie, and I'm sure many of you have been unable to sleep nights waiting to see how that would all turn out; well, here is your answer: they're pretty close, but Hot Fudge Sundae is creamier and richer, and more chocolate-y. It smells more like brownie mix than the Brownie fragrance does (neither smells like an already-baked brownie), and it also has better (albeit considerably less than excellent) lasting power. 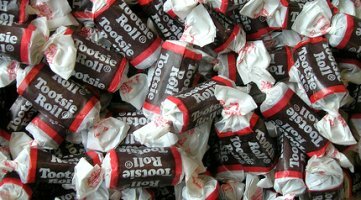 I'd never really noticed it before, but Tootsie Rolls don't have much of an aroma. I tried heating one in the microwave to see if that would help, and the result was a very light but vaguely unpleasant odor. This odor is hard to describe, but it certainly doesn't smell like anything edible, much less chocolate or caramel. I suppose Demeter didn't have much to work with here, but their Tootsie Roll smells equally inedible, kind of like a mixture of plastic, chocolate and vanilla. There are many people who don't get the appeal of Demeter; who ask: why would you want to smell like gingerale? or crayon, or swimming pool? All I can say is you either want to or you don't, but when these "scent memories" work, they make me smile. Tootsie Roll does not make me smile. It does, however, have reasonably good lasting power. The Reese's Peanut Butter Cups fragrance doesn't work for me either. Like real Reese's, it doesn't smell all that much like its supposed components, peanut butter and chocolate, and while the Demeter version does an adequate job of capturing the entirely synthetic aroma of the real product, Tootsie Roll and Reese's turn out to be candy products that I'd rather eat than smell (in fact, I was forced to eat 2 Reese's cups while writing this). I haven't any Junior Mints on hand, but going on memory, the Demeter version is both a successful rendition and much more fun to wear than the Tootsie Roll or Reese's. It's a huge burst of sweet mint with hints of that dark chocolate food product that makes up the outer shell of the real Junior Mints, my long-time movie food favorite. It made me smile, but only briefly: this one is short-lived. Hershey's Kisses and Hershey's Special Dark are both just ok. The Kisses doesn't smell all that much like chocolate, but then, neither do real Hershey's Kisses (and yes, I just ate 3 to be sure). I'm fresh out of Special Dark bars, but the perfume version is somewhat richer than the regular Kisses, as I suppose it should be. It still isn't as rich or chocolate-y as the Jelly Belly Hot Fudge Sundae, though, nor does it last as long. I guess it would be hard to market a Demeter scent based on, say, Dolfin Noir Cumin or Scharffen Berger Mocha, but all of the chocolate fragrances reviewed here reflect the fact that these popular childhood candies from The Hershey Company and Tootsie Roll Industries just don't smell all that wonderful to begin with. If you want some chocolate from Demeter, the best under consideration today is the Junior Mints, but the best overall chocolate from Demeter (and the only one I'd wholeheartedly recommend) is still the Jelly Belly Hot Fudge Sundae. I should note that Demeter also makes Chocolate Chip Cookie and Chocolate Covered Cherries fragrances and I've never tried either; please comment if you have! For buying information, see the listing for Demeter under Perfume Houses. Note: image is Tootsie Rolls [cropped] via Brave Heart at flickr; some rights reserved. I just enjoy my cup of Earl Grey tea from Demeter:)) I love junior mints so I'm gonna have to see how they smell from Demeter! Great article, Robin!!! Hey, I'd buy Scharffenberger Mocha if Demeter made one! I haven't quite crossed over into the candy smells from them – still working on the more traditional stuff, like Earthworm. Heh. I think Demeter's strategy or “perfume” positioning has changed quite a lot in recent years. It seems that it's now more into foody/ cocktail scents and collaboration with other brands. Did this change happen after or because of Christopher Brosius leaving Demeter? If you love junior mints, betting you'll like the scent! I still need to try that Earl Grey tea — in fact, I'll never catch up on all the Demeters, will I? I'd buy it too! But don't know how it'd do at Sephora. I'd say you're best off with things like Earthworm — the “old” classic Demeters have made me happier than all these newer licensed product scents. Agree, they're doing more licensed sets w/ other brands. I don't think it's necessarily directly related to CB leaving, since that was awhile back and these are fairly recent, but it's clear they're trying to grow and stay relevant & young & whatnot. Still, my recent favorites have also been from the non-licensed Demeter line — Incense, Egg Nog, etc. I'm curious…so what's the latest HG chocolate scent out there (excluding Demeter)? I've tried a few, but haven't found any that make my mouth water or remind me of chocolate! Now I want to layer Incense and Egg Nog. What a fun review! I want them to do a Vosges line of scents, especially Naga (sweet Indian curry, coconut , & deep milk chocolate) and Red Fire (Mexican ancho & chipotle chillies, Ceylon cinnamon, & dark chocolate). Chocolate Chip Cookie smells decidedly synthetic–unpleasantly so, like dollar-store cookie dough with “chocolate” chips. I actually thought Tootsie Roll smelled like chocolate buttercream frosting, and I believe someone over on Perfume Posse had the same impression, too. I quite like Brownie, and it lasts a few hours on my skin, very good for a Demeter. You're right that Junior Mint is delightful, probably the best of the batch. It smells exactly, precisely like its namesake. Yes! and the whatever Pearl bar, the one with the wasabi — I love that one. Guessing the latest is Montale Chocolate Greedy? But that's from last year, so maybe there's something newer I'm not thinking of. Wow, I could've lived w/ chocolate buttercream frosting! I'm not getting that at all. Not fair! I like brownie too, just think the Jelly Belly one is better (and smells more like brownie). Hmmm…maybe I should reword that. What's the greatest chocolate scent (not necessarily recent)? I know it's all a matter of opinion, but it would be great to try some of the best. Or maybe there's a blog entry somewhere that lists the greatest chocolate scents of all time? Would that be equivalent to sneaking a hip flask into Christmas Eve mass? I really want to get my hands on several demeters like crazy. I've never tried any of them and I'm dying to, but I think I'd be more likely to give CB I Hate Perfume precedence. There's a lot of stuff I want to try from that line and I think I'd appreciate the complicated a little more. For my 11 year old sister, however….well, I may have to get her some for Christmas and *ahem* sample them…. I think for now, I will stick to eating my chocolate. If I wore a chocolate scent, I am afraid I wouldn't be able to focus on anything else. Then there's Serge Lutens Bois 1834, and I'll have to see what else I can think of. The emphasis at CB IHP is more on the artistic side, rather than the fun + cheap, so that's a reasonable decision depending on what you're looking for. Oh, and L'Artisan Piment Brulant, and Dawn Spencer Hurwitz Piment et Chocolat. And Parfumerie Generale Musc Maori. You asked for the best, and instead I'm giving you a list, I know. GIggles, Robin sure goes above and beyond, doesn't she, Erin? I must be the only person on the planet who doesn't like Peanut Butter Cups or Tootsie Rolls. That said, microwaving tootsie rolls to increase sillage? The things you do for research!! Hey, Robin! Don't worry about it. Guess I thought perhaps there was something out there that was considered the PERFECT or #1 chocolate scent by consensus and polls…like Mitsouko is always named best scent ever. I guess chocolate isn't something everyone wants to smell like, though, so perhaps it's not at the top of anyone's list. There's always Angel. I'd love to try Borneo 1834. I wore Coromandel yesterday from a sample I have. OMG. Perfect comfort scent!!!! Surprised that I liked it cause it was mostly amber on me…and I typically detest amber! Just found a post on Bois de Jasmin titled “Chocolate Fragrances: From Flowers to Woods.” FYI to anyone who's interested. I'll shut up now. Karin, I really don't think there is such a thing — a truly iconic chocolate fragrance. Let me tell you, they don't look attractive melted. And worse when they cool. Have you ever heard of a “Kitty Litter” cake? Start w/ a yellow cake. frost w/ white frosting and sprinkle graham cracker crumbs heavily over the frosting. Then you add microwaved Tootsie Rolls to the crumbs. I know, I know revolting image, but this goes over big at a 7 year old boys birthday party!! When you said they don't look attractive melted, my mind flashed back to this culinary nightmare. Hey, I've heard of kitty litter cake! Never tried it though….. just the image is a deterrent….. This scent might smell good layered with Montale's Patchouli Leaves, which has patchouli, musk and vanilla. I have a young boy, so surprised I've never heard of that! Can't say I'm dying to make one, though. Montale Patch Leaves mixed with the Demeter Jelly Belly Hot Fudge Sundae. Aha — that might be lovely!